This week I am introducing Tiny-rannosaurus to several groups of children. We are reading a computerized version of the book, and then playing with its themes and images in a mini-project. 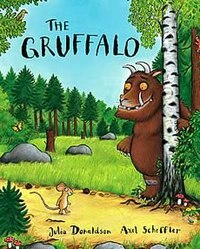 We are exploring its characters, its locations, and its wonderful chomping, growling, roaring, stamping, charging, slamming vocabulary. 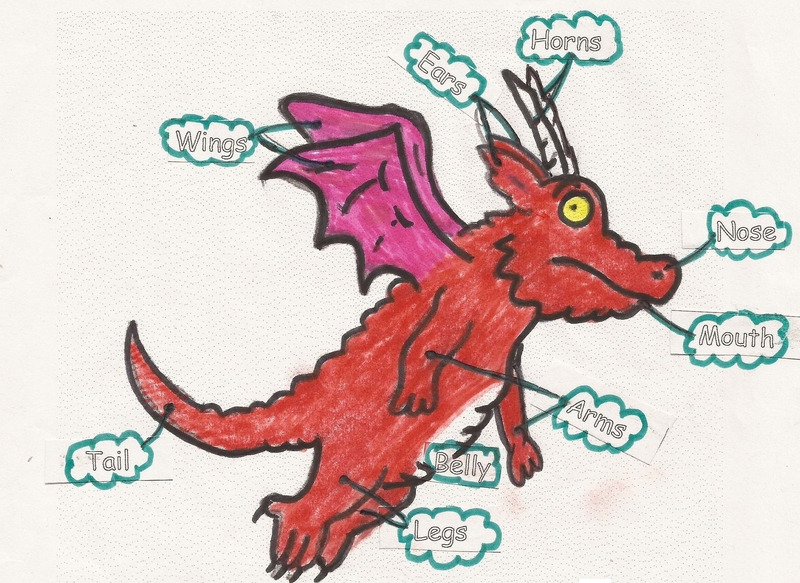 And not forgetting, the labelling of body parts, the learning of a little about the dinosaurs behind the characters and the creating of some great ‘rannosaurus art’. I hope that it will be enjoyed by all. 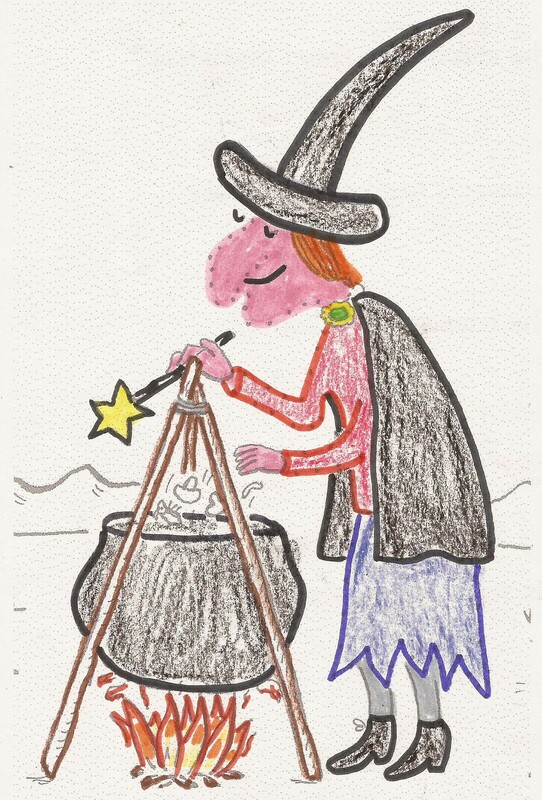 Here is a witch and her black cauldron. Her skin is pink and her long hair is ginger. She is wearing a tall black hat and short black boots. Her black cloak has a yellow and green cloak pin. Her shirt is red, and under her purple skirt she is wearing grey tights. This exercise works on the children’s knowledge of colours and clothing, with older pupils mastery questions, using both the present simple and present continuous, are also used. ‘Story time’ is ‘special time’, so before the class began I transformed a corner of the classroom into a ‘Room on the Broom’ story telling zone by laying blankets on the floor and putting out soft toys of cats and dogs, birds and frogs, and a pair of ferocious Welsh dragons. 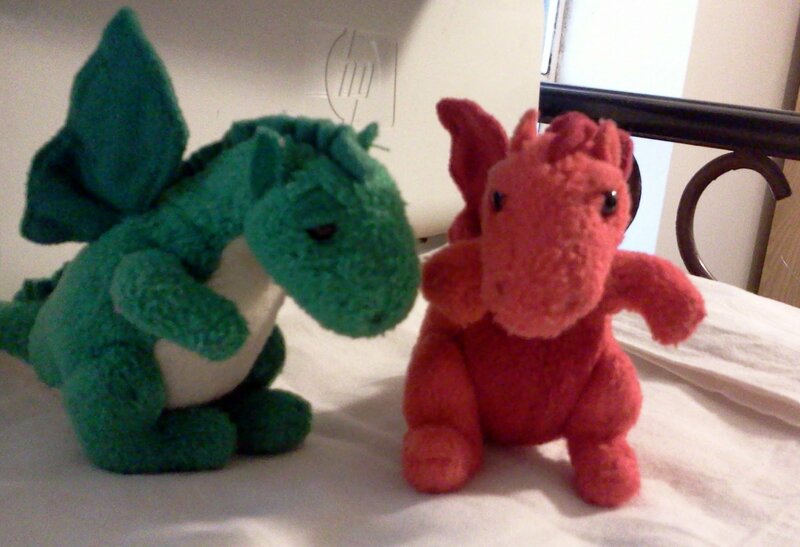 Welsh dragons resting safely back at home after an overexposure to excited children. The children really enjoyed the interplay of the toys and the multimedia book, so we will be certainly repeating similar episodes in the future. Earlier this week at the Finžgar primary school in Barcola we began to explore Halloween. We embarked on the topic with a multimedia board enhanced reading of Julia Donaldson‘s Room on the Broom. 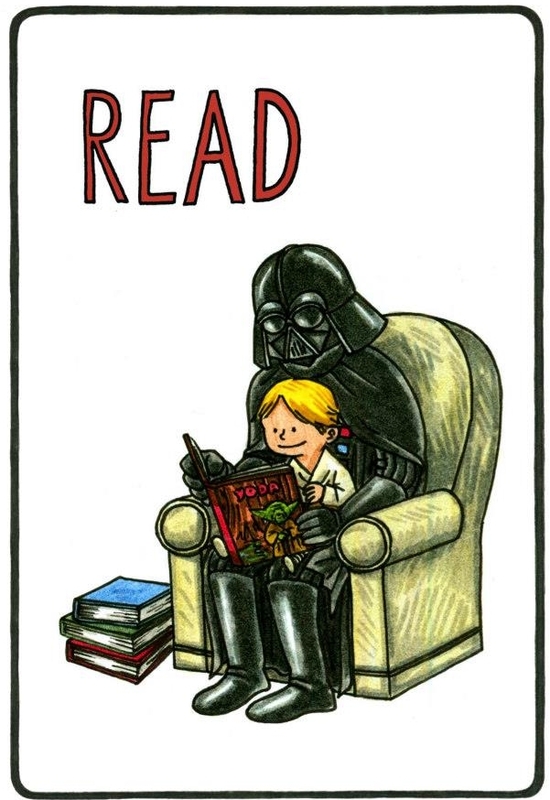 I love it when publishers provide different ways of reading and interacting with their literature, and more importantly the children love it too. So, we read and spoke about the book, its words and images, and then we begun with our first Halloween worksheet entitled ‘Witchy Words‘. The younger class cut, stuck and coloured this worksheet, while the older class wrote and coloured this one. Our ‘Creatively English’ course in Barcola began with the primary school’s second and third class. We started by reading the first book in the classic ladybird Peter and Jane series. The children enjoyed reading this on the big screen, along with the frequent reading pauses in which we talked about what was on the page and about their own likes and play habits. After reading the book together, we looked at the alphabet and sang the alphabet song. We ended our time with teams racing to spell words with letter tiles. Our after school English club at Barcola started marvellously yesterday. The fourth and fifth classes began their ‘Curiosity English’ course with a reading of ‘Tiny-rannosaurs’ by Nick Ward. It was a great a read and the kids really enjoyed it. While reading the book on the interactive board, we used adhesive word labels to identify certain characters and features. We then started exploring the story and its words a little deeper with the aid of a few book inspired worksheets that I had created for the occasion. We finished off our time with the children working in teams to spell Tiny-rannosaurus words with letter tiles. There will be more Tiny-rannosaurus exploration next week, as well as starting a project looking at real prehistoric life.